the second episode of postcards from home is up! 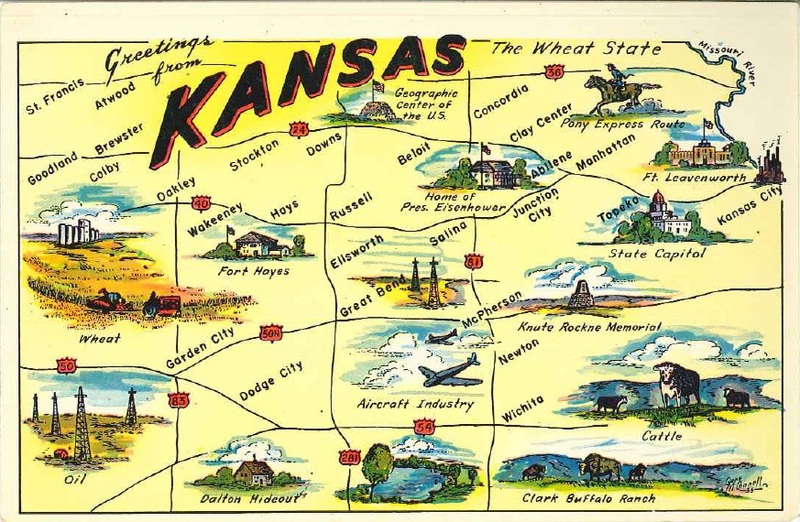 on this show jenny & i talk about a postcard from kansas aka the wheat state. click here to listen, and check your mailbox for a postcard from us. jenny & i recorded more material for our audio series, postcards from home. click here for a preview. the next full episode should be up in a few days. thanks for all the positive feedback so far. i bought this thing that can hijack a keyboard. i’m not sure i’ll ever use it to it’s full potential, but it should turn a few heads when i use it for mondo beep. if you’re wondering how i did this, click here… if you’re wondering why i did this, i can’t help you. 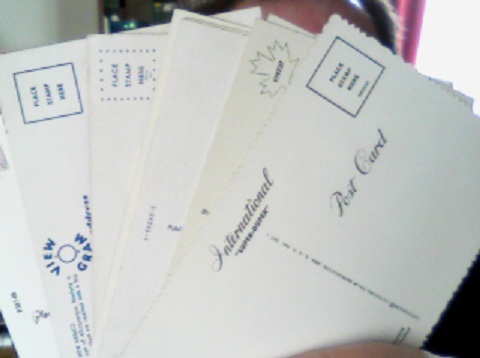 postcards from home is a new audio series where jenny & i talk about old postcards and then mail one of them to someone. the idea came to me last week during a visit from my parents. 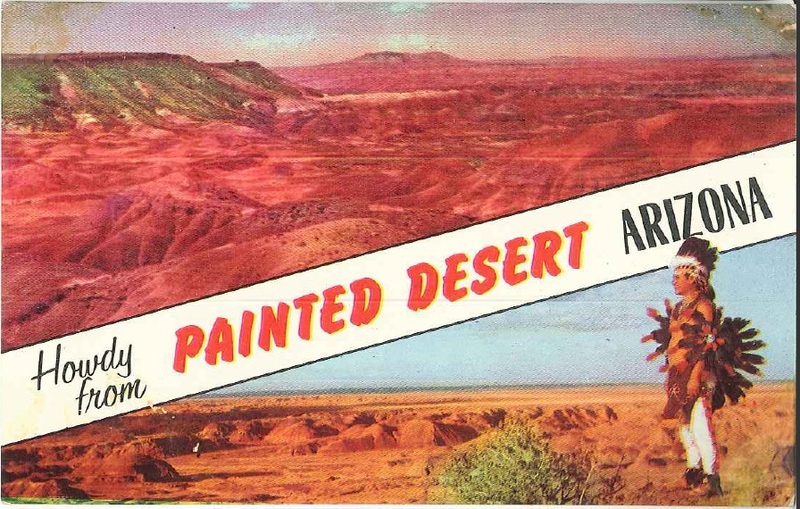 we looked through a shoebox of old postcards that provided alot of entertainment. i didn’t want to write anything until we had actually recorded something. listen to it here, or click below. i ordered another gadget for mondo beep last friday. the makey makey will result in performance art with fruit, vegetables, and other household items. i’m tracking it on amazon.com. apparently it was shipped from massachusetts, and it arrived at a fedex station in earth city, mo around 9:00 last night. i wonder who got to name the town, “earth city.” should a planet have a city named after it? maybe it would be a good ruse if aliens invade, believing that they need to occupy earth city, the very heart of the earth… only to find out that they are in a far flung suburb way outside of st. louis. yeah, the joke would be on them. i hear alot of cool retro stories about artists from the 80′s on casey kasem’s american top 40. the last one i posted was about bruce springsteen. 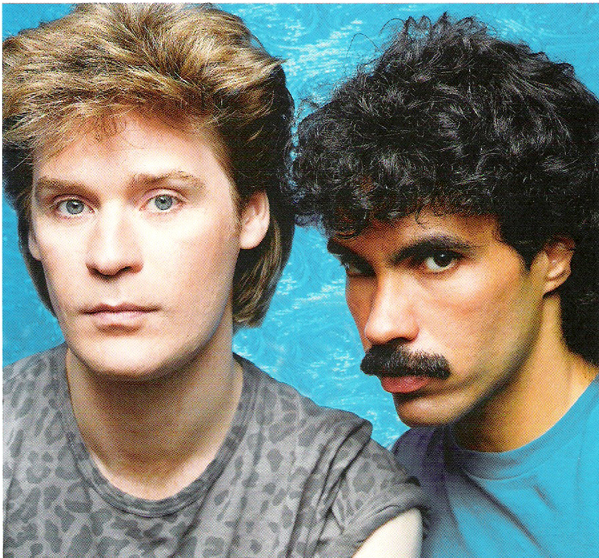 today i heard an amazing story about hall & oates. this one’s for you kelly. 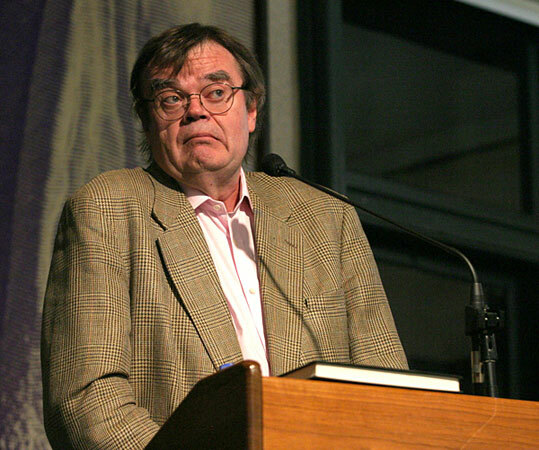 i know that garrison keillor has hosted a prairie home companion forever, but until this morning i had never heard his podcast: the writer’s almanac. it’s just a little 5 minute thing, and the poem for today was great. i went to a few thrift stores today to see what they had in the way of retro electronics and/or vintage t-shirts. 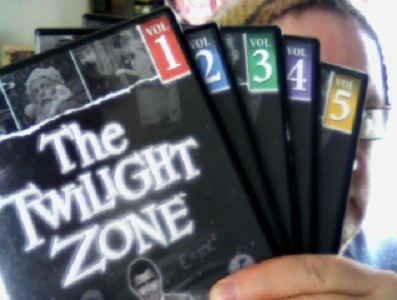 while i was at red racks the cashier asked a trivia question over the loudspeaker, “what is the longest bone in the human body?” when i answered “the femur,” she gave me a dvd box set of the twilight zone… for free. We are basically the same age (you’re almost 3 weeks older than me), and even though we’ve lived different lives, there has to be a common bond between us… the same pop culture references (although i’ve heard that you’ve disassociated yourself with alot of 80s related material), similar teenage humiliations… stuff like… being bullied into pushing pennies along the floor with your nose, or getting hit in the head with a chalky eraser, stuff like that. If you haven’t figured it out, those examples are personal– not hypothetical… but seriously, there has to be something that connects us, other than the fact we were both born in 1966. You also seem like you would be a really cool guy to hang out with. i’ve actually had a couple of dreams where we are just sitting outside on a park bench, and hardly saying anything… not in an awkward silent way though… a car goes by and you look up, and I’m doing a crossword. 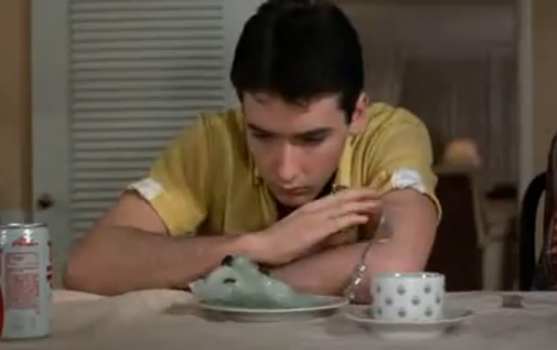 And you know, even if I never hear from you, I can tell my friends that I left a message with JOHN FREAKIN’ CUSACK! Hey, did you know that you share a birthday with Mel Brooks, Mary Stuart Masterson (she was even born the same year!) and Mr. Miyagi (Pat Morita) from the Karate Kid? Just in case you were wondering, I have seen most of your movies, and I’m pretty sure I would recognize you in public… but don’t worry, on the slim chance that I actually see you, I would give you a nod, and that would be it. Don’t worry about me getting weird (whispering to my friends, pointing at you, staring) because I would barely acknowledge you if I were to see you at the airport or something… very much the same way I ignored Rob Lowe when he was at Kansas City International that one time. He was wearing a ball cap and sunglasses, but it was him. You know, I’m probably more confident about sharing all of this personal stuff with you because you’re NOT the first celebrity I’ve met… others include: Peter Maxx, Jim Brickman, Gordon Jump, Trent Harris, and Walter Stedman. OK, It feels like I’m rambling now… but honestly I feel closer to you when I ramble. I’m that weird guy who peppers his conversations with movie lines from your characters that seem to talk too long in a scene… like Martin Blank talking to his psychiatrist or Lloyd Dobler trying to impress Diane Court’s father. I don’t want to buy, sell, or process anything anymore than Lloyd does. Well hey I better wrap this up, I had no idea your machine would let me talk this long… and it’s alright if you don’t want to hang out, or you’ve got enough friends, I understand… I’m leaving a message on Jeremy Piven’s answering machine right after this, just in case I don’t hear back from you. See ya. 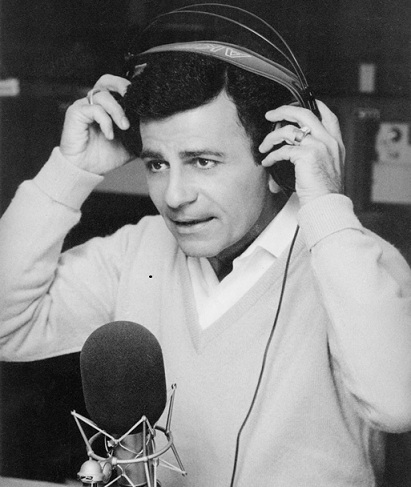 last december i blogged about casey kasem counting down american top 40 hits from the 80s, and how cool it is to hear the reruns. one of the most recent shows that aired had this shout out to joplin, mo.